NYC Public School Parents: Isn't it time we had an educator, for a change? Wow! It sure has been an interesting couple of days. Lots of news and commentary on Klein's resignation and the Mayor's appointment of Cathie Black to replace him. 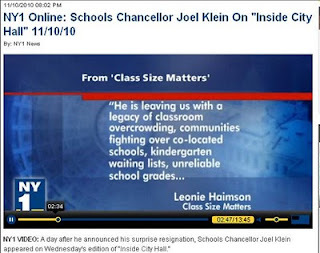 On the disappointing Klein legacy, I was quoted in the AP, the Times, NY1, am NY, Education Week, NBC News, and elsewhere. I was personally attacked by the NY Post, and by Joel Klein on NY1 last night. When confronted with my quote from the Times, Klein called me a "propagandist" with an "agenda" (see video clip, starting at 2:30 minutes in.) Yes, I do have an agenda: for smaller classes and better schools for our kids. There has also been much controversy and criticism of the mayor's appointment of Cathie Black, a publishing executive to succeed Klein. See the front page of the Daily News (below), this Times story and and these articles on our blog. Parents and elected officials alike have pointed out that Ms. Black sent her own children to private schools and has no education background, except for serving on the advisory board of a charter school. Given her lack of education experience and qualifications, Ms. Black needs a waiver from the State Commissioner to be appointed chancellor. Please sign the NYC Kids PAC petition, to urge the Commissioner to deny her a waiver. As soon as you sign it, the petition automatically sends an email in your name to the Commissioner Steiner, to the Board of Regents, and your state legislators,. Even if you have signed other petitions, please sign this one now, since it has an immediate impact. The mayor would never dare appoint a magazine executive to head the police or fire departments. Leading the largest school system in the country needs just as much expertise, if not more. Only an educator is likely to recognize the necessary elements of a quality education, and how to work effectively with parents, teachers, and members of the community to create them. No matter what skills Ms. Black may have as a corporate manager, she simply has no idea what our children really need to succeed. We have had nine long years of a non-educator; it is time for a change. Please also forward the petition link to your friends, and post it on your Facebook page. Here's hoping for better days! Thank you Leonie for being there for everyone in the community. You truly GOT ADVOCACY! Teachers appreciate your support. Happy to see you getting this sort of attention, Leonie. It's an honor to be called a propagandist by a demagogue like Klein, and I certainly hope you're taking it that way. I'll show my support again by sending money to Class Size matters. Can't imagine what the mayor and Klein would have gotten away with if we didn't have Leonie and her gang - our favorite watchdog group. Happy to add my support. Just a side note: The US DOE is run by a Secretary of Education who has neither taught nor ATTENDED a public school. Ever.